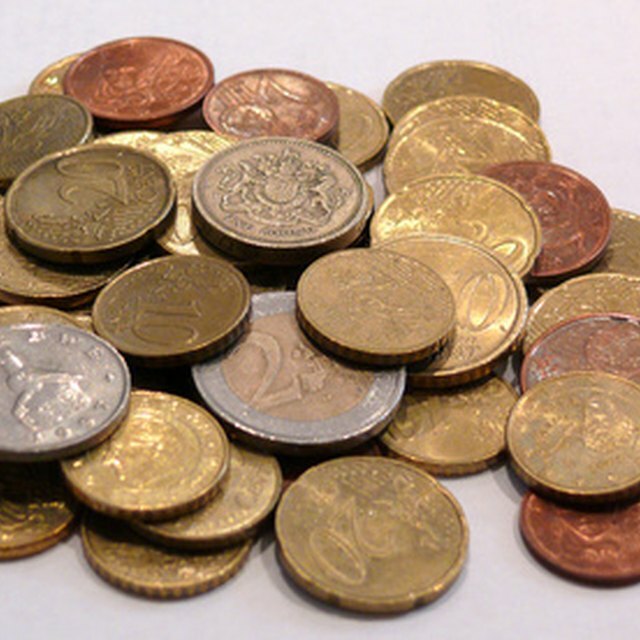 Common monetary coins include cents, nickels, dimes and quarters. Other types of monetary coins include the silver half dollar and gold whole dollar coins. Coins accumulate quickly, like when you pay for something using paper money and the total includes coin change. When you receive your change it includes coins. You may choose to save your coins in a jar or piggy bank, or use the coins for future purchases. When you want to count your coins, sorting your coins makes it easier to keep track of how many or how much you have. Put your coins on a flat surface and spread them out. Use the marker to label each cup or bowl with the names of the coins, such as dimes, nickels, quarters and pennies. Draw four circles on a sheet of paper and label each circle with the names of the coins. Sort the coins by putting them in order based on the name on the label. For example, put all pennies in the cup, bowl or circle marked "pennies" and put the dimes in the circle, bowl or cup marked "dimes." Obtain a coin sorting machine from a local retailer or online shopping options. Choose from an electronic digital sorter, a motorized sorter and a sorter that stacks coins with or without a wrapper. When depositing your coins in a bank account, wrap the coins before taking them to the bank. Place the coins on the designated area of the machine. Press the start button or drop the coins in the area to start the sorting process. Retrieve the sorted coins from the machine. Most coin sorting machines count the coins and give a total dollar amount for all of your coins.